Outdoor Event Management: Are You Prepared? Entertainment events are generally held indoors in theatres and arenas, but some occur outside in a variety of different conditions. When events are held outdoors, it becomes a challenge for all staff members. Extra consideration must be held when performers are required to perform in special circumstances such as parades, publicity events, and television appearances. During the holiday season, many New York City productions are requested to perform at all kinds of holiday events, many of which take place out in the chilly weather of the Northeastern United States. These events include the Macy’s Day Thanksgiving Parade, the lighting of the Rockefeller Center Christmas Tree and dancing live on the NBC Today Show. During these events the performers are smiling, happy and in beautiful costumes (sometimes summer-like), but may be rehearsing or performing in typical fall/ winter weather. This can include everything from chilly temperatures to early blustery New York City mornings. New York City’s fall season can be warm at times but traditionally the Northeast sees mostly brisk mornings and evenings. During outdoor rehearsals, performers are encouraged to dress in layers to try to stay warm, but once the show begins, the costumes are rarely appropriate for cold weather. It is important to be prepared during both rehearsals and performances with “ready to go” warmth. Performing arts athletic trainers routinely carry blankets and gear for the performers to use while waiting. Another helpful tool is a disposable heating product, such as hand and foot warmers and Thermacare, for warmth pre-and-post shows. 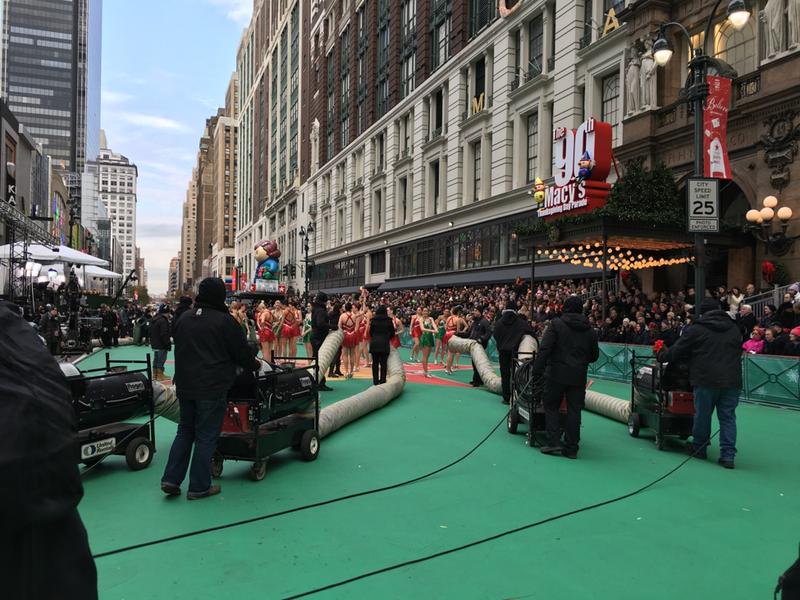 Large events such as the Macy’s Thanksgiving Day Parade have large heating units to keep performers warm, but smaller events do not offer this advantage. Another important thing to remember on cold days is to remind performers to stay active which will help them stay warm. When performing indoors, an active warm up is important, but when rehearsing or performing outdoors it is critical to maintain an active warm-up when the temperatures are freezing. Remind the performers to stay active: stretch, jog or march in place, etc. The Show Must Go On! Whether that is the Macy’s Day Parade or the dropping of the New Year’s Eve Ball in New York City, these events occur regardless of rain, sleet or snow. Many theater costumes were created and designed to be worn on an indoor stage. These costumes often do not provide coverage to legs and arms and most always require the use of high heels or dance shoes for the feet. These shoe requirements are not intended for outdoor surfaces. It is important for athletic trainers and physiotherapists working in the outdoors to have adequate towels and drying materials on hand, not only for the stage surfaces, but also to keep footwear as dry as possible through multiple rehearsals and the performance itself. In more traditional sporting events, the athletic trainer/ physiotherapy staff may be asked for guidance on cancellations in the case of dangerous weather like lightning. In performing arts; however, many times the production staff of the event, may not know there is an athletic trainer/ physiotherapist present or if there is one at all. In many cases, the event will go on, even if the conditions are not ideal. The event staff must be prepared for these instances and help the performers the best they can. One way to combat this safety issue for the event staff and healthcare team to walk through the venue together. Any and all hazards on the performance surface will be assessed at this time. Bring towels to dry your shoes in case it rains. Although most events have security teams in place to regularly monitor an event, it is important for everyone to evaluate the event’s surroundings and have an emergency action plan in place. Although emergency plans may not be rehearsed like in a home facility like the theater, upon entering a location it is important to evaluate where an emergency exit might be and how to safely remove a performer from the area. Prior to the performance, a private area should be identified for use if an athlete needs to be assessed for injury. In the case of a sporting event, the athlete can often be taken back to a private locker room, this is often not an option in the performing arts. Ask if there is a health care provider on site if your company does not have one full time. Have an athletic trainer or physiotherapist on site or at least an emergency medical provider or ambulance. All special events come with their own set of challenges and dynamics, outdoor events are no different. Regardless of location, safety precautions should be taken seriously. Safety comes first and foremost, especially and during the holidays for the performing athletes and staff who make the events happen. Many performing arts and entertainment organizations have a full time or part time athletic trainer, physical therapist, or physiotherapist. These staff members have an important role, to keep everyone on stage dancing, acting, and performing. Athletic trainers have allied health care professionals who are board certified and work in countries all over the world. If your organization does not have an athletic trainer on-site, you should ask your management to provide one even if it’s only for performances and events. It is important to take safety and precaution seriously with the right staff in place. Meg Schneider, MS, ATC is a National Athletic Training Association (NATA) certified Athletic Trainer with years of experience in a variety of professional and amateur settings. She joined the Chicago Bulls Entertainment team as their co-head Athletic Trainer in 2013.